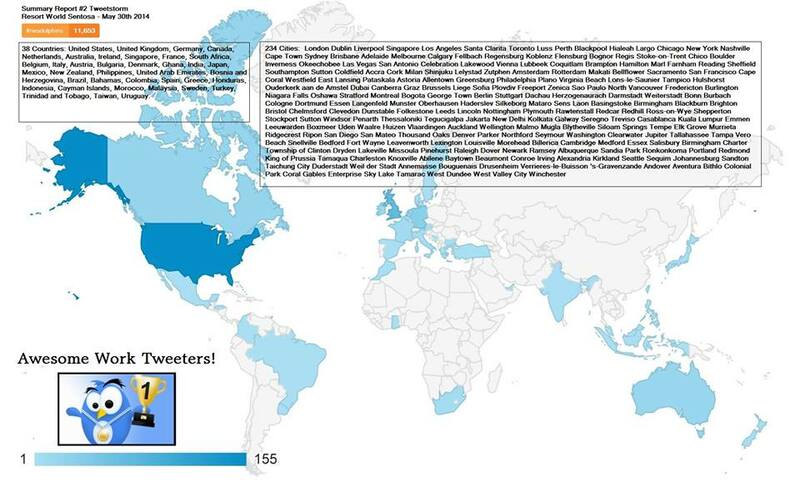 38 Countries, 234 Cities Produced 11,653 Tweets For Dolphin Freedom!! 38 countries, 234 cities produced 11,653 tweets for release of the remaining 23 dolphins at the Resort World Sentosa slowly dying in captivity. 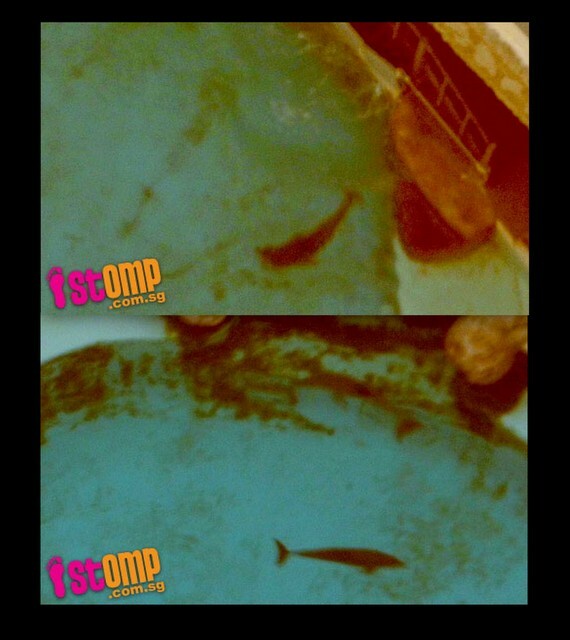 On May 13, 2014 it was reported that yet another dolphin has died from the original 27 dolphins captured and sold to Resort World Sentosa. Dolphin advocates joined forces, during a Tweetstorm organized by the Facebook page Save The Blood Dolphins. Barbara Napoles creator of Save The Blood Dolphins had this to say about her personal motivation for the Tweetstorm: “When I read that another dolphin had passed, once again I could not stand by and now with new our team of talented activists on Save The Blood Dolphins it was decided that those that enabled the export needed to be exposed”. Social media activists would turn out ten fold to produce 11,693 Tweets that continue to grow now topping at 122,690, exposing the terrible exploitation and treatment of endangered Indo-Pacific dolphins, captured for Resort World Sentosa in the Solomon Islands in 2007. Napoles also created a petition entitled: “Please Help Free the “Sentosa 23″ from Resort World in Sentosa Singapore”. Today the petition has 122,629 signatures gathering more and more signatures everyday. 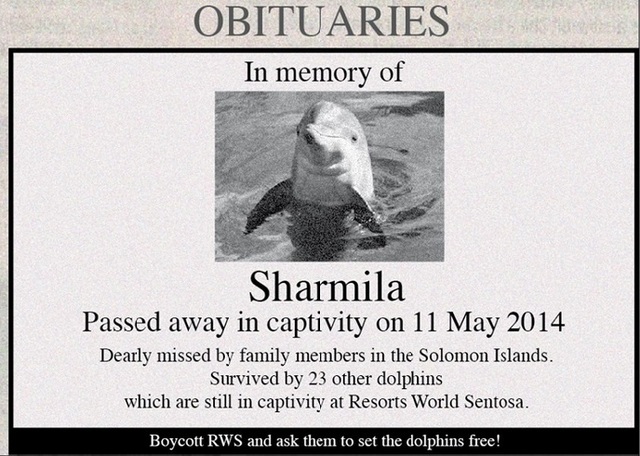 Please share this post in memory of Sharmila, Wen Wen and the other dolphins who have died, and to give a voice to the remaining wild-caught dolphins at Resorts World at Sentosa. Thank you to Kuan Eng for speaking up for Sharmila through the creation of this striking image. 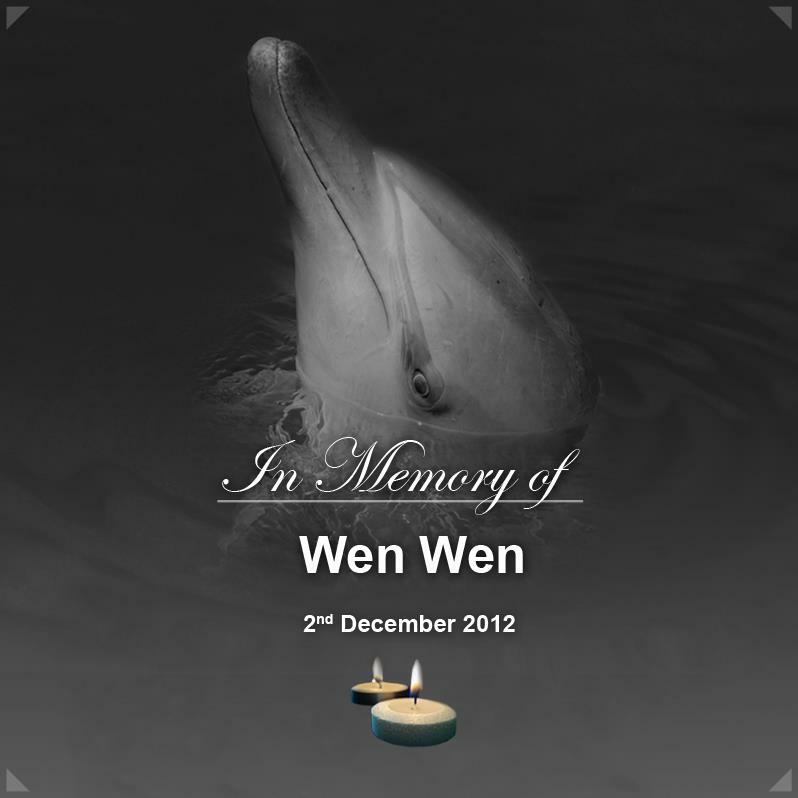 Wen Wen died while being transported from a dilapidated enclosure to Resort World Sentosa Singapore. 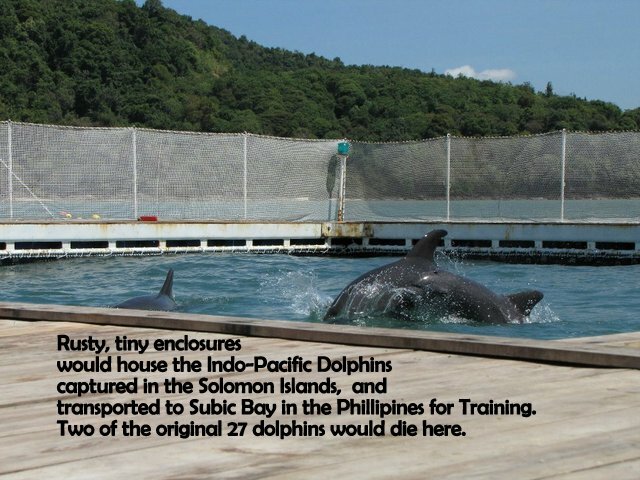 The original 27 dolphins were transported to tiny, rusty enclosure in Subic Bay in the Philippines. Two of the dolphins would die here. 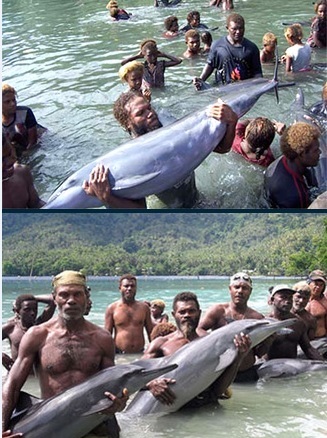 Things would change dramatically in 2003 as Marine Export Ltd. (MEL) would come to the Solomon Islands convincing islanders to capture dolphins for marine parks. 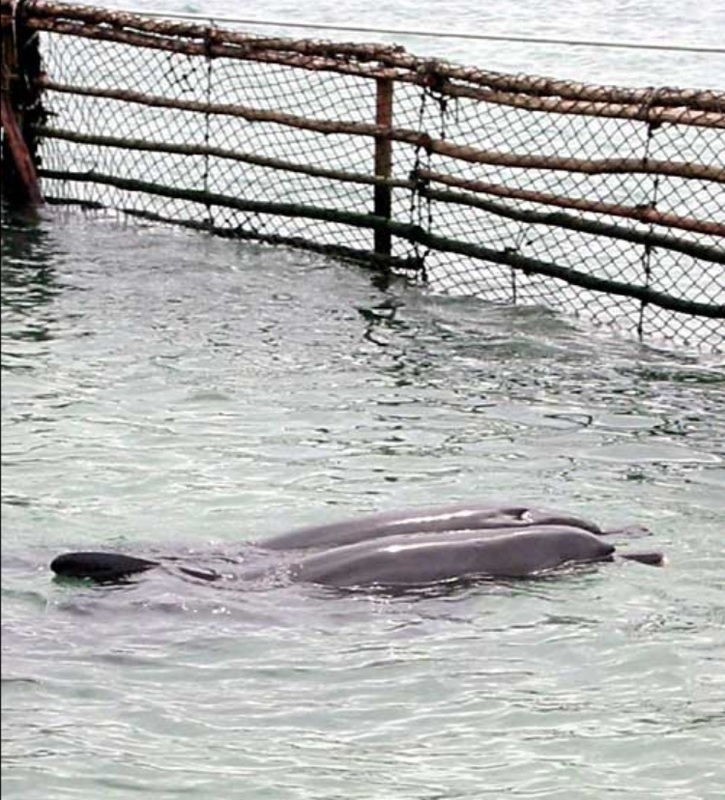 MEL kept the dolphins in a shallow, murky fenced off area that took many lives. 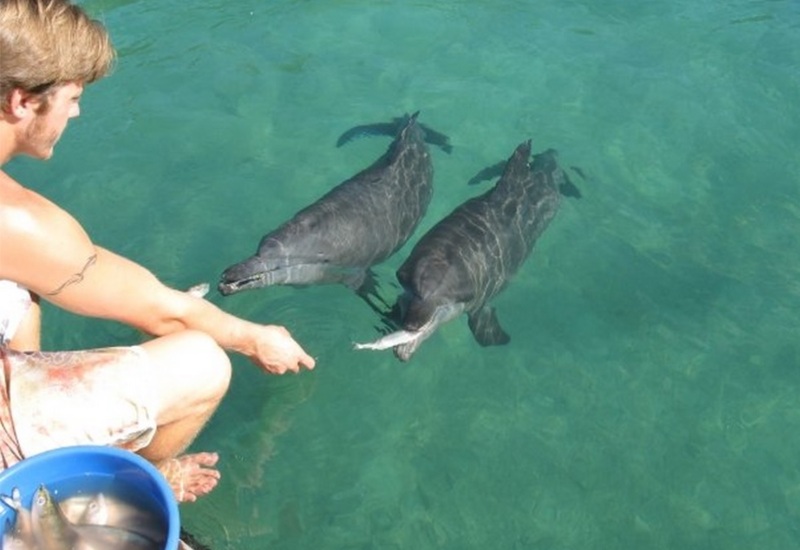 Robin Friday Jr. of Wildlife International Network/ Ocean Embassy feeding and training wild captive dolphins for sale. 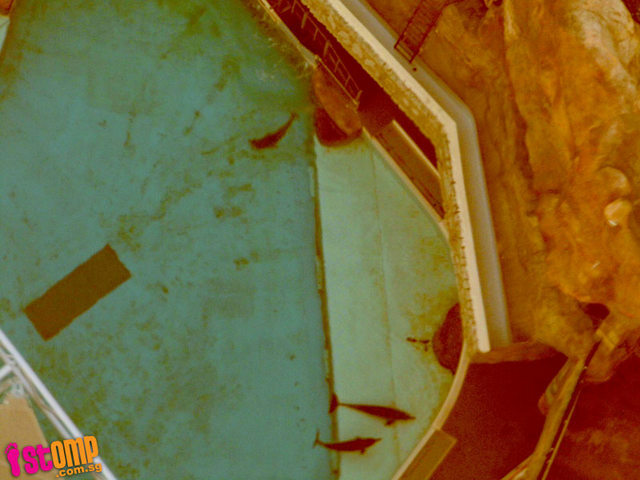 Notice the shallow water the dolphins must swim in. Robin Jr. and Chad Friday prepare dead fish for the captive indo pacific dolphins with an islander. 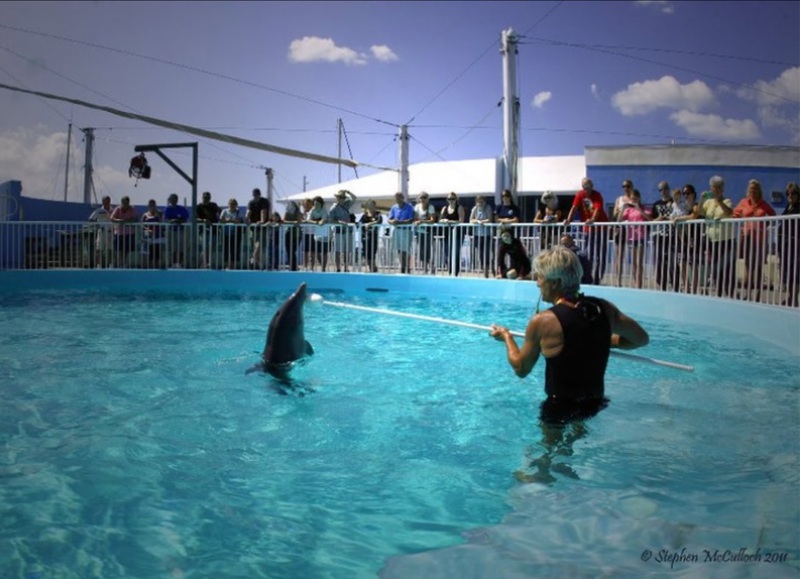 Robin Friday dominates Hope and reinforcing “tricks” for the dolphin shows at Clearwater Marine Aquarium. It is easy to see why the death of yet another wild Indo-Pacific bottlenose dolphins motivated so many people to speak out by tweeting out 11,653 times. 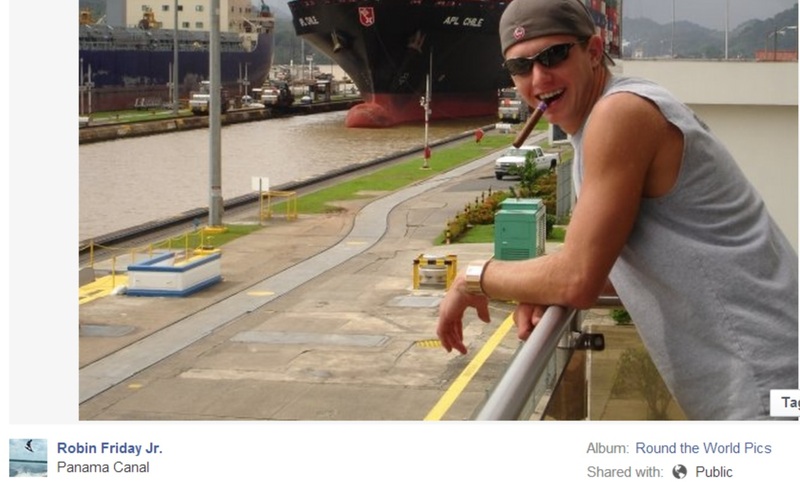 Robin Friday Jr. Panama Canal, around the world at the expense of wild Indo Pacific Dolphins? Isn’t it time that organizations like Ocean Embassy/ WIN composed of ex SeaWorld, Marine Park trainers be exposed and stopped before more dolphins are ripped from their families and the oceans to line their pockets with gold. The world must become aware that the captive industry is a business that will stop at nothing to make a profit. Ocean Embassy’s white washing of their activities behind training stranded dolphins and releases may fool non profits like Born Free who has not responded to our inquiries regarding their relationship with Robin Friday bur not true dolphin advocates who recognize cetaceans as free ranging, highly intelligent beings. (Robin Friday worked with Born Free to help with the release of Tom and Misha despite his history as a dolphin trafficker. Born Free has not yet commented on our inquiries). 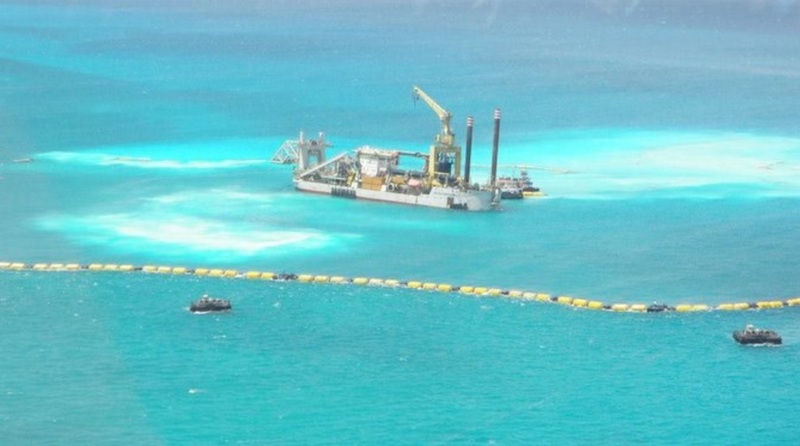 Resort World Sentosa also continues to show their real colors as they dredge Bimini destroying a critical habitat and coral reef to create yet another huge resort, that they most likely hope to populate with more wild dolphins obtained by their partners at Ocean Embassy/WIN. 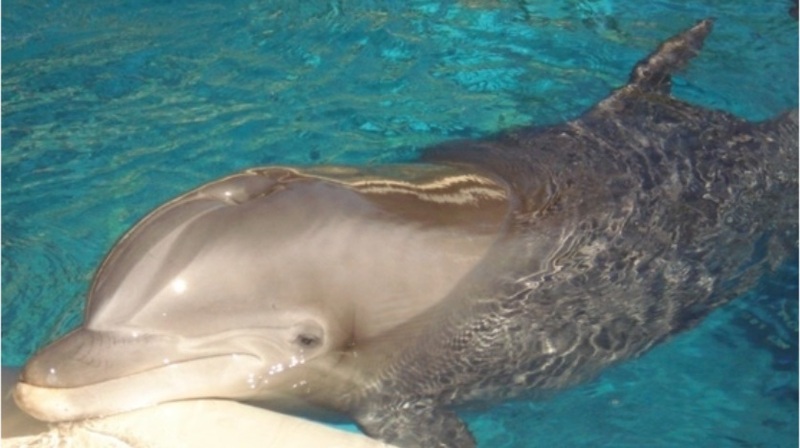 Join the fight to free the worlds Saddest Dolphins!! 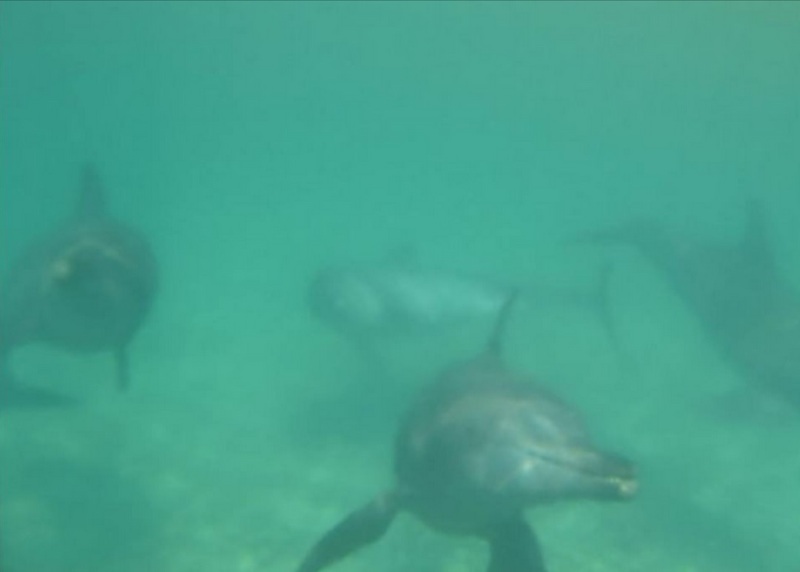 This entry was posted in Cetaceans, Dolphins, Whales and tagged Bimini, dolphins, Indo-Pacific Bottlenose Dolphins, Ocean Embassy, Resort World Sentosa, Robin Friday, Save the Worlds Saddest Dolphins, SeaWorld, Solomon Islands by Kirsten Massebeau. Bookmark the permalink.